The 416 and Burro fire closures as of July 12. The San Juan National Forest has re-opened trails and roads – including the Colorado Trail – that were part of a closed area of the forest near the 416 and Burro fires. The areas were originally closed because the fires were spreading toward them, said Gretchen Fitzgerald, spokeswoman for the San Juan National Forest. “At this point, the fire’s quit advancing,” she said. The fire did not reach any of the trails, so no trail damage was done. Falling trees and mudslides should not be a threat on the trails. Most prominently, the Colorado Trail is now open from Molas Pass to the trailhead at Junction Creek in Durango. The Colorado Trail sees a lot of use, as do the trails and roads near Purgatory. All of the trails in the re-opened areas see use, but some in more remote areas or on the Dolores side may be less popular than the ones closer to Durango, Fitzgerald said. In some places, especially at higher elevations, trail users may see burn scars or hot spots. These are not dangerous to trail users because they are occurring well within the fire perimeter, Fitzgerald said. The Burro Fire came within a few hundred feet of the Colorado Trail, but it is now cooled off. “We wouldn’t open them if there was any danger at all,” she said. Fire managers do not anticipate the fires to significantly grow or pose a threat to public safety. 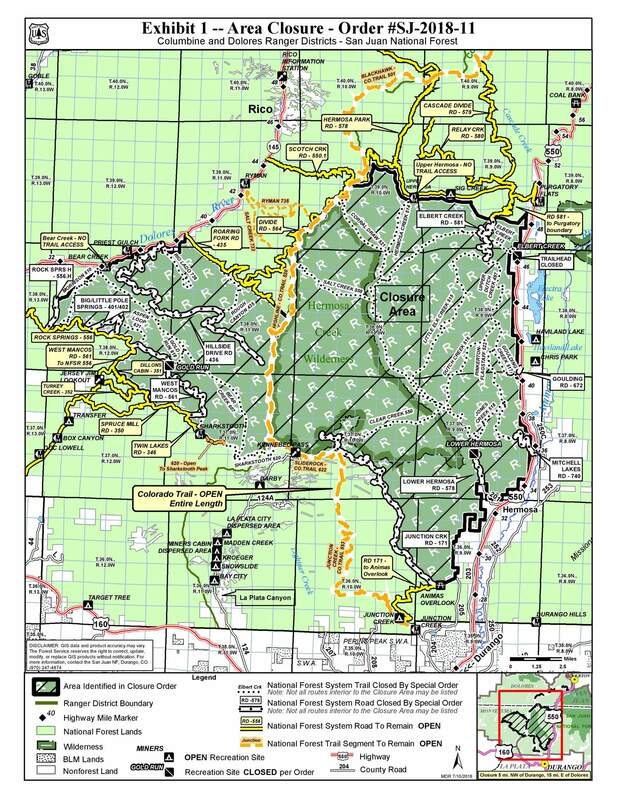 The Forest Service does not anticipate any more of the closure area to be reopened until the fire is put out because the closure now mainly represents the burned area. Fire managers say snow will eventually extinguish the fire, so the areas that remain closed will not reopen until next year, Fitzgerald said.